is an assessment test that examines both the general and subject-related abilities for academic studies. It assists refugees in continuing or starting academic studies in Germany. Universities use TestAS individually or as part of uni-assist’s documentation-examination procedure for refugees. The test may be sat country-wide on specified testing dates. Universities may appoint special test dates for larger groups. You can increase your eligibility for the subject, demonstrate your academic interests to universities and increase your chances of being admitted to university. If documentation regarding the courses attended at university or school certificates are missing (i.e. lost while fleeing), then the test may be used as a plausibility check. The test is also used for admission to preparatory programmes. The TestAS for refugees can be taken once only and is free of charge for the test takers (for details please see “Test dates”). 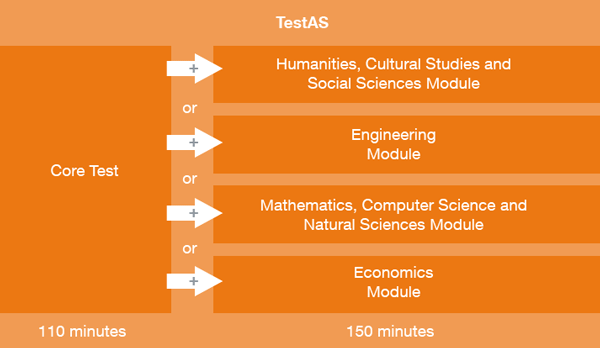 Universities use TestAS individually for the admission to their preparatory programmes and for admission to academic studies. Upon request, g.a.s.t. will advise universities on how TestAS results can be used for admission. g.a.s.t. has been testing refugees with TestAS since September 2015. For universities using uni-assist’s documentation examination service for refugees, TestAS for refugees is the prerequisite to manifest the genuine desire to study as well as the suitability for the course (alternatively, universities may issue a so-called “counseling certificate”). The evaluation of application documents of international students and refugees for admission to university is handled by the Arbeits- und Servicestelle für Internationale Studienbewerbungen uni-assist e. V. in Berlin on behalf of many universities. These applications are free of charge for refugees. Look for a suitable test date [link at the bottom]. All prerequisites for an application to uni-assist are available here or at the university of your choice. TestAS for refugees consists of a Core Test, which assesses the general ability to study and one out of four subject-specific modules. You can select a subject-specific module matching your planned course subject. The test may be sat in German, English and Arabic. TestAS is offered by the Society for Academic Study Preparation and Test Development (g.a.s.t. ), a registered association. TestAS is developed by ITB Consulting GmbH. The worldwide organisation of TestAS is conducted by the TestDaF Institute, Bochum. TestAS is sponsored by the German Academic Exchange Service (DAAD) with funds from the German Federal Ministry of Education and Research (BMBF). TestAS for refugees is not a knowledge based test, you cannot “learn by heart” to prepare for it. The test assesses your cognitive skills. It is therefore important that you familiarize yourself with the format of the tasks asked in the test. A comprehensive booklet with Sample Questions, explanations and solutions is available free of charge. Universities, testing centres and institutions may also order the Sample Questions from the TestDaF-Institute. The Sample Questions describe all subtests in detail. Please note that the participating centres can vary between the test dates. – If you have registered for the test but do not show up your participation still counts. That is because a large part of the costs have already incurred. – You can cancel your registration for the TestAS until the end of the registration period (send an email with your participant number to kontakt@testdaf.de). After that period we cannot guarantee your cancellation. – The login data that you choose during registration only work for the test-taker portal for the TestAS for refugees (Test-taker portal TestAS for refugees). They cannot be used to log into the regular TestAS portal. – In case you have taken the TestAS for refugees on May 19 2016, you are permitted to take the test a second (but no further) time in the test language Arabic (but not in German or English). – In case you were registered for the TestAS for refugees on May 19 2016, June 25 2016 or July 28 2016 but you did not show up, you are permitted to register a second (but no further) time. – In case you have taken the TestAS for refugees once already but you would like to take the test a second time with another subject-specific module, you are temporarily permitted to do so in the following case: In the first TestAS for refugees, you have reached a standard value of at least 100 (100 or higher) in the core test and a standard value of under 90 (89 or lower) in the subject-specific module. We also provide group testing at your institution – do not hesitate to contact us. Contact form. Please keep in mind that for a test session at your location we need a lead time of at least four weeks in order to allow the testing session to go smoothly. Results will be released after seven working days. – Family members (parents, children, spouses), who have joined recognised refugees or asylum seekers as defined under the Geneva Convention or those granted subsidiary protection, may also participate in the free review process if they can provide proof that the “principal” person (the first to be granted refugee status) has a residence permit.You will be asked for your status when registering for the test. You will then be able to sit the test free of charge. Please have photos or scanned residency documents ready; you will be asked to upload documents when registering. Your TestAS certificate will be available for download from your candidate portal approx. 2-4 weeks after the test. The Standard Score is a transformation of the test score to a value between 70 and 130. The mean (average) is 100. The area between 90 and 110 describes the average performance. The standard score allows a direct comparison between all test modules and subtests. The Percentile Rank describes the percentage of other test takers who have a test score that is lower or as good as a candidate’s score. A percentile rank of 60 means for instance: 60% of all test takers have a lower score or a score that is as good as the candidate. That means that 40% have reached a higher score. Universities can create a rank order with the percentile ranks of the current applications (to, for example, select the applicants with the 10 best percentile ranks). Both scores always refer to the entire test-taker group (in all test centers and from all test dates). Standard scores and percentile ranks are calculated for both the modules (e.g., the Core Test) and for the subtests. The standard score/percentile rank of a module does not always correspond to the average of the standard scores/percentile ranks of the single subtests. Universities decide individually how they use the TestAS results. They can, for instance, define a minimum for the required standard score (e.g., 100) or give applicants with high scores a bonus. Please visit the universities’ webpages for further information.